Out of stock: "Tales of the Old Margreve (Print)" doesn't have sufficient quantity in stock. 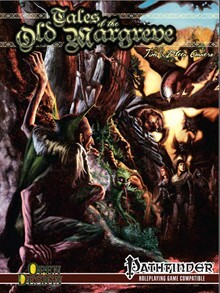 Tales of the Old Margreve contains 8 eerie forest adventures for the Pathfinder Roleplaying Game in a unique Old World setting inspired by the medieval folktales and superstitions of Eastern Europe. Here in the Old Margreve Forest, heroes trek past crumbled griffon towers, over stiles and shepherds’ fields, to where the lonely road thins and branches under the dark canopy of the trees. Deep in the forest’s misty hollows, you may hear the rusalka’s song rising over the crackle of a midnight fire or glimpse the white flash of a deer centaur’s tail as it vanishes between the trees. In this place, those who ignore the old ways are never seen again. Unexpected powers wielded by the living forest itself! 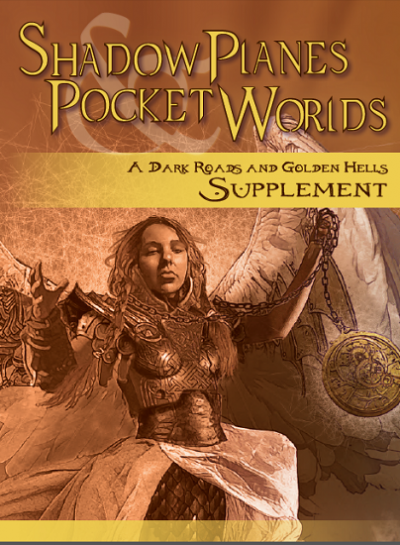 Whether you choose to take your players into the legendary forest between the realm of the vampire knights and the clockwork city of Zobeck, or cherry-pick its contents for your own campaign world, Tales of the Old Margreve will challenge your players to earn a place in fireside tales. Written by Tim and Eileen Connors, Richard Pett, and Open Design patrons, with frequent review, playtest and feedback to maximize playability. 112 pages. Opening with an atmospheric tale in the traditional style, this product is all about making deep untamed forests a scary place for adventurers to go… much as, in time past, the average mediaeval peasant did not venture beyond the bits he knew well, just in case a hideous monster or hungry wild animal ate him up, or worse. The dark canopy of the Old Margreve Forest is home to many a strange tale and creature, inspired by Eastern European traditions and other folk tales… and those who do not heed the Old Ways are never seen again. First up is a gazetteer section. An ancient brooding forest, seemingly left behind by the passage of time, its interior is little known and just plain feels wrong to the visitor. Some druids talk as if the forest itself were alive, others claim that there’s a Presence dwelling therein. Be that as it may, best behave and don’t light fires carelessly! For even if it is not alive, the Margreve acts as if it were, noticing and remembering and responding to those who set foot there. There are reports of strange noises, shifting paths and the like, and metal tends to rust abnormally fast. Some even claim the forest diverts streams and game animals away from those it dislikes! Naturally, it’s up to the GM just how much of this is rumour and how much actually takes place, but the Margreve is statted up to be able to do all this and more should you so choose! The Gazetteer then moves on to discuss the history and geography of the forest, along with some plot hooks. 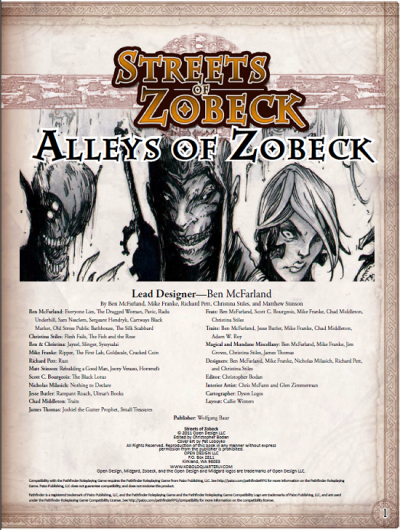 Whilst it’s located within Open Design’s Land of Zobeck setting, it would not be too difficult to transplant it to a suitable location in your own campaign world if preferred. There’s a major road right through the middle, few are brave (or foolhardy) to stray off it… and the even smaller number who return to civilisation have many a tale to tell. A scant handful of villages are found deep within the 30,000 square miles of the forest and the inhabitants are decidedly strange, and with unusual practises they call the Old Ways which allow them to live in harmony with the forest. The discussion moves on to magic within the Margreve. A little of the energy of every spell cast within the forest is siphoned off, being the main way that the ‘presence’ powers itself. This causes some interesting visual effects, as well as a margin reduction in the spell’s effectiveness. Some delightful confusion may result, as for example, if two people cast divination spells at the same time, they may get each other’s results! Naturally, forest lore tells of methods to circumvent these effects, or even bend things to your favour. A selection of new forest-related spells follows. Next comes the Margreve Bestiary. An interesting habit is not to name – or at least, not to speak the name – of monsters found there, and it is suggested that the GM adopt this habit when describing encounters… mind you, I have long been a proponent of giving a description or holding up a picture rather than telling players that they see a gnoll or whatever, at least until I know their characters have reason to know what one is at sight. One inventive creature is the deer-centaur, which has the upper body of an elf and the rest is a deer rather than the human/horse conjunction of the traditional centaur, and is considered better adapted to forest life than centaurs who are suited to wide-open grassland. These can be played as characters or encountered in woodland glades. There are many other strange creatures here, often blurring the lines between plant and animal and promising to bewilder any naturalist seeking to record the forest wildlife! The rest of the book is a collection of adventures set in and around the Margrave. First up is Hollow by Richard Pett, aimed at 1st-level characters, which concerns the troubles that plague a small village on the forest’s edge. An atmospheric episode with plenty going on, pitched at the right level for characters beginning their adventuring careers. Next is The Honey Queen by Jonathan McAnulty. Apparently some bees make magical honey that confers long life on those who eat it, and the characters (of levels 2-3) are asked to obtain some. This is followed by a grim (or is that Grimm?) fairytale for 4th-level characters, Challenge of the Fang by Dan Voyce. Characters must earn the Margreve’s favour by participating in a blood-soaked ritual. 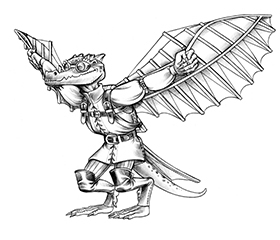 Creative and stealthy 5th-level characters can then try The Griffon Hatchling Heist by Michael Furlanetto, where they are asked to retrieve a distraught griffon’s eggs from a bunch of brigands! The theme of an ancient brooding forest runs strongly throughout the entire book, and all the adventures meld to produce what could be a powerful campaign of coming to understand at least a little of its ways. There’s plenty going on, and a good sense of life proceeding whether or not the characters are there, although the adventures tend to the linear if each is to be resolved successfully. And not a dungeon in sight, an enticing setting for those who like a complete world that does not revolve around raiding underground. Now, where can I find some players…?